I use AirDroid WEB and when I try to download pictures from my LG G3 to my Mac 27, I can only download one picture at a time. If I select multiple photos the program stops and remains locked until I left the program. In practice no longer it created the corresponding zip file as they did before. Can you download multiple pictures on web.airdroid.com? No, I use ONLY web.android.com but multiply pictures ca not downloaded! And would you please sign in toweb.airdroid.com to see if you can download multiple pics. 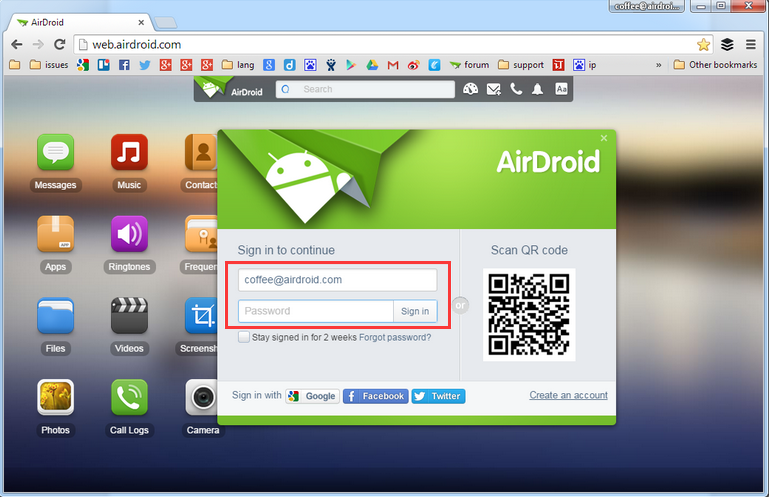 Open a supported web browser (Chrome, Safari, Firefox, IE) on computer and visit web.airdroid.com, sign in with AirDroid account, and you'll connect to your Android device instantly (Requires the same AirDroid account signed in on AirDroid Android app first). The LTE connection is not working. If on my smartphone using a WIFI , multiple downloads will not work.